Some countries are known as ‘A land of milk and honey’ but Provence is known as ‘A land of olive oil, lavender, sunflowers, sun-ripened tomatoes, blue skies and sunshine’. It is an ancient land, rich in history drawing people for millennia. 600 years before Christ, Greek traders came to this major crossroads of Europe. Invasions from the sea, the north and the east, enriched Provence’s unique culture. Throughout the area, evidence of the Roman presence of 2000 years ago dots the countryside. During mediaeval times the papacy resided in Avignon for over 100 years and to this day the Pope’s Palace in Avignon remains a magnificent monument. It is a diverse land, encompassing every type of terrain. From the snow-covered Alps, to undulating green hills, wild thyme and gorse-covered garrigues, salt flats and magnificent coves, Provence offers something for everybody. 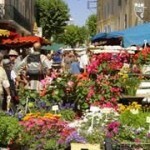 The tastes of Provence are an invitation to come here and experience flavours of both land and sea. To wander through the weekly and daily markets tasting small morsels of goat’s cheese, olives of every variety, sausages, sun-ripened vine tomatoes, spring and summer vegetables inspires us to venture into cafes, restaurants and kitchens to experience the finished product. Come and visit this beautiful land and experience all it has to offer. 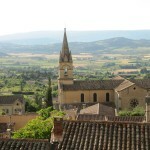 The Luberon is a range of mountains separated from the Vaucluse plateau by the Calavon River . 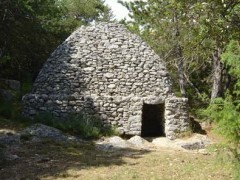 Access to it is gained via the Pont Julien, which has been in use since Roman times. 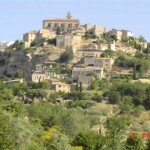 Bonnieux is the privileged village sitting on the southerly slope of the Luberon. It rises in a succession of terraces up to a summit capped by the old church. 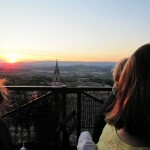 From this vantage point the whole of the northern side of The Luberon can be seen. Below, colourful streets and alleyways lead to attractive, often discreet, houses, vaults, fountains, gardens, and patios full of flowers. 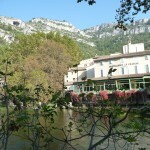 There are many restaurants, cafes, galleries and boutiques here for visitors to enjoy. From Bonnieux, explore the Route des Cedres (Cedar Route) which reaches its highest point at the hill crest with panoramic views over an array of landscapes. Hillside in springLacoste, a superb village facing Bonnieux and dominated by the remains of the castle of the Marquis de Sade, brings together a series of old houses alongside colourful alleyways cut off by what is left of ancient fortifications. 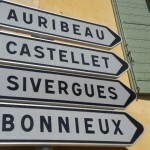 Menerbes is another fortified village on this side of the Luberon, which is built on the crest of a promontory. Again, one can browse though this lovely village. 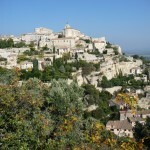 Gordes, lying on its hill like the Acropolis of Provence, is one of the 100 most beautiful villages in France . It has a splendid mediaeval castle, fascinating winding streets and boasts the Bories village, a unique group of dry-stone constructions which are the remains of a primitive communal-type settlement. Lying in a peaceful valley on the road to Murs is the Abbey of Senanque which is a masterpiece of Provencal Romanesque art. To this day monks live there amidst lavender fields. 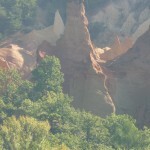 Roussillon, another of the 100 most beautiful villages in France , is built on a cliff composed of breathtaking yellow, red and white quartz sands combined with ferruginous sandstones and ores. 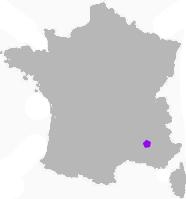 Its urban layout closely follows the pattern of other Provencal villages: a crown surrounding the top, which will be either the church or the castle, for here, as elsewhere, the population had to defend itself against all manners of threats. As well as sightseeing there are many activities to enjoy locally including horse riding, tennis, golf and hiking.